David Moyes can have no complaints at his treatment from Manchester United fans, according to one of the club's most high-profile supporters. Moyes was sacked this morning after a disastrous 10 months in charge. "The fans have been very supportive, surprisingly so under the circumstances," said Andy Mitten, editor of the United We Stand fanzine. The club put a lot of trust into Sir Alex's decision but who else would know who was the best person to replace him? "David Moyes can have absolutely no complaints about that, but the vast majority will not be disappointed." Mitten noted a difference in attitude towards Moyes at Old Trafford compared to the social media sites which, in latter weeks, have been so critical. Indeed, a plane trailing a 'Moyes Out' banner ahead of the Premier League encounter with Aston Villa last month was booed as it circled Old Trafford. Ultimately though, managers are judged by results. And the Scot, who celebrates his 51st birthday on Friday, simply did not deliver. 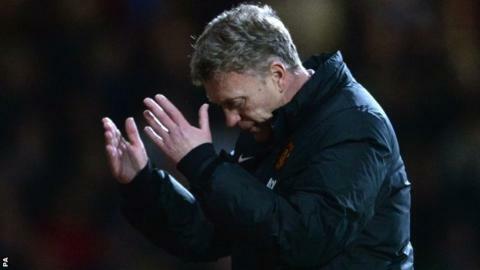 "David Moyes spoke about the difficult start, so the fans accepted early disappointments," said Mitten. "But then October came and went, November, into January, still that improvement did not happen. And results this year have been even worse. "Added to that, the football itself was poor and he always seem to capture the wrong mood. "At times he would be positive and optimistic at other times it was exactly the opposite. Yet on each occasion it tended to go against the general view of the game. "I was at Cardiff when he said a draw was an acceptable result. I could point to another 20 occasions this season when he has said something similar. I just thought 'you are Manchester United manager - you can't say things like that'." Moyes, who was convinced he had the ability and resolve to succeed at Old Trafford even as he understood the near-impossibility of following the club's greatest ever manager with one of its weakest squads, has seen his defining ambition end in total humiliation. Admitting Liverpool were favourites for a recent meeting at Old Trafford was another example, while Moyes' repeated use of the words 'try' and 'hope' did not sit well with supporters of a club accustomed to battling for the biggest prizes. Sir Alex Ferguson was responsible for the appointment, but Mitten does not believe he should get the blame. "He made a mistake," said Mitten. "People do. "The club put a lot of trust into Sir Alex's decision but who else would know who was the best person to replace him? He knew more than Joel Glazer did. "I do not buy into the argument that he did not want his successor to succeed. I think he will be as disappointed as anyone that this has not worked out. " Ryan Giggs must now steady the ship ahead of a permanent appointment in the summer. "Personally, I would love Ryan Giggs to be the manager for the next 30 years," said Mitten. "He has done his coaching badges, which is difficult when you are still playing, and he won't take any messing about in terms of discipline and control. "The question mark is the experience side of it. "